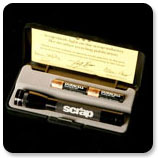 Every advertiser was rewarded with a flashlight and carrying case which allowed Scrap to show its appreciation, as well as have their logo in the hands of a wide variety of people. All inquiries to the website will be directed to the proper account executive. If you were referred to us by another party please let us know so that the proper account executive can handle the inquiry. If you have not worked with us before we will assign an account executive who will best meet your needs.